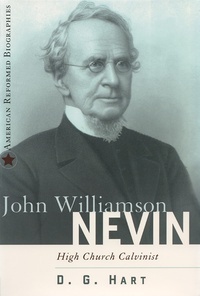 John Williamson Nevin (1803-1886) taught at Mercersburg Seminary when he wrote The Anxious Bench (1843) and The Mystical Presence (1846), volumes dealing with revivalism and the Lord’s Supper, respectively. The last ten years have seen a revival of interest in this theologian, a graduate of Princeton Theological Seminary. This second volume in the American Reformed Biographies series will help readers gain a better understanding of the sacraments, as well as give them insight into Nevin’s critique of the revivalist tradition. The extensive documentation, substantial bibliographical essay, and index encourage further study.